The Humlegården park is in the centre of the city. It's full of playing children, business men hurrying to a meeting looking sleek and business-y, and then there's people like us, who are in the park to enjoy the Swedish summer. Tures is a restaurant just outside the Sturegallerian. We sat at the terrace outside and spotted Blondinbella, a blogger who is huge in Sweden. I opted for a steak béarnaise with fries, vegetables and an ice cold glass of Pripps Blå. The food is quite good and from the terrace you can do some people watching. Perfect. Biblioteksgatan is a shopping street where you can find lots of cool shops including my favourite beauty store Sephora. I only allowed myself to buy a hand sanitizer which is the only one I swear by. Looking for a spot in the sun to have a coffee or some wine? Kungsträdgården (Kungsan for the locals) is the perfect place for that. There are lots of small outdoor cafes which are located between the trees so you won't feel like you're in the city. 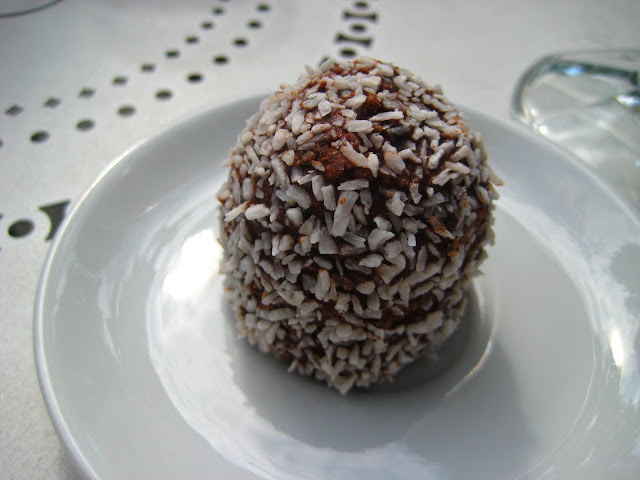 One day we took a mini-break here in the sun with huge ice lattes and chokladbollar! On your way to the old town, you'll see Helgeandsholmen, a small island which connects the old and the new part of Stockholm. The old part is touristy and very cute. We sat down at one of the oldest fika places for coffee and cakes. After walking around the old town we found the Royal Palace overlooking the water. I wanted to check out some of the Scandinavian shops like Bikbok, Gina Tricot, Kicks and Lindex which are all housed under one roof at this gallerian (I can't remember the name of this one). I definitely want to go to this restaurant/bar next time I'm in Stockholm, it looked really cool. I was really surprised at the amount of sushi places there are in the city. It's so popular there! Sushi in Sweden is relatively cheap and really good because it's at the sea so the fish is fresh. We ate at a little place called Jappi. Another thing you can't miss is the Harrods of Stockholm: NK. It's a huge department store which you can only find in Stockholm and Gothenburg as far as I know. .. and ended up at Strandbryggan, a sea club at the water. It's a nice place to sit, chat, have a few glasses of wine and enjoy the sun. I almost felt like I was on holiday in the Mediterranean. And way too soon it was time for me to go home again and wake up from my midsummer dream. I promised I'd be back soon. Maybe in winter time when I can go ice skating and eat a kanelbullar hot from the oven..